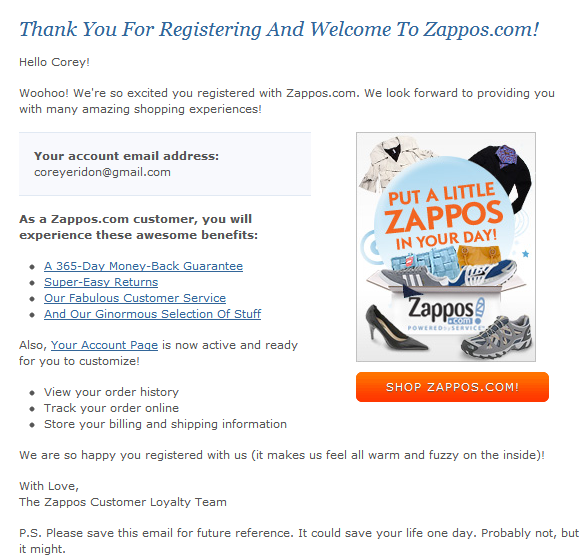 Email marketing has come a long way in just the past few years. But with all the fancy new functionality brands are utilizing, you know what’s kind of funny? A well-written, plain-text email can perform just as well (if not better) than a highly designed email with tons of bells and whistles. In fact, no matter how fancy your marketing emails look, if they’re devoid of well-written content, your subscribers will stop opening -- and start deleting -- your messages. So, how do you write a great marketing email? It all comes down to a few copywriting best practices that you should apply to both the subject line of your message and the message body itself. 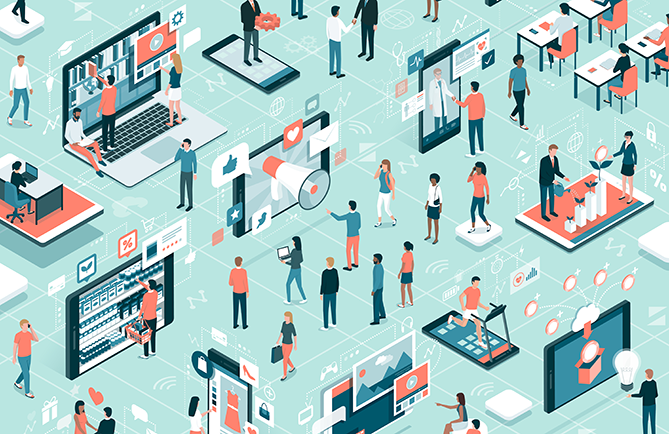 Next time you draft a message for a lead nurturing campaign or just a one-time email send, ask yourself whether your copy meets all of these guidelines first. We'll start with copywriting tips for better subject lines, followed by copywriting tips for the bodies of your emails. Part of writing effective email copy is nailing the subject line. The subject line is like the gatekeeper of your email: No one gets to read your stellar email copy if they aren't interested enough to open your email in the first place. That interest is garnered almost wholly on the subject line of the email (with the sender name playing a role, as well). We've written a few blog posts about crafting email subject lines, including one on the anatomy of a great subject line and one showing 18 examples of awesome subject lines from brands. Here's a distillation of what you need to know to write some excellent copy. With email subject lines, using actionable language doesn't necessarily mean using verbs, although it certainly helps. OpenTable, for example, sent me an email that said "Take Mom to Brunch" in the subject line. This is one way to use actionable language effectively in email subject lines: by incorporating a verb (like "take," "download," "reserve," "ask," "buy," etc. ), the reader knows exactly what they can do in the email. But there are ways to use actionable language without relying on verbs, which gives you more room to play around with wording. What it comes down to is using language that makes it clear to the recipient what they can do with the information in the email, should they choose to open it. In other words, keep the value for the user top-of-mind. Emails that are highly segmented tend to have higher performance levels -- such as open rate and clickthrough rate -- than emails that aren't personalized. 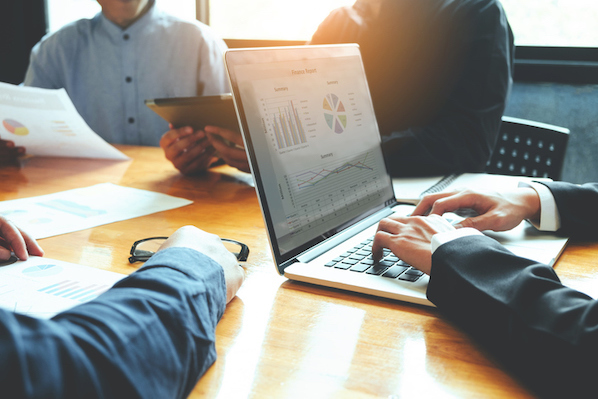 According to a study by Direct Marketing Association, segmented and targeted emails generated 58% of all revenue for the marketers surveyed, and 36% of revenues were driven by emails sent to specific target selections. This isn't exactly surprising. After all, the more segmented your email list, the better able you are to personalize the subject line and provide relevant content to that email recipient. So ask yourself: Is there a way to make your email subject line more personal? And I'm not talking about the dynamic field where you insert someone's [FIRSTNAME] -- email recipients stopped being impressed by that fancy functionality some time ago. Some of them are looking to rent, while others prefer to buy. Their ideal location ranges across several cities and zip codes. They all have different price points with which they're comfortable. Some are looking for a studio, while others want a mansion. You even know that a group of them will only accept homes that have been renovated in the past 5 years. You certainly wouldn't do a blanket email send across all of these different segments of your list, would you? And your email subject line wouldn't be the same, either. You might have one subject line that says, "Renovated 1BR Apartment for Rent in Cambridge: Schedule a Viewing," and another that says, "RSVP: Open House Sunday for Colonial House in Sudbury." Each subject line speaks to the radically different needs of two radically different list segments. 3) Prioritize clarity, and only then think about "catchiness." Write a subject line that is clear first, and catchy second. In marketing copy, clarity should always, always, always be your first priority. If, after you've drafted a clear subject line, you can also make it catchy, funny, cute, whimsical, whatever, then go for it. But never sacrifice clarity for the entertainment value. UD | Nunchucks. Made from Beer Cans. Finally. UD | It's Ice Cream. It's Beer. It's Beer Ice Cream. UD | Here's a Private Bahamian Island. Do Your Thing. Some of these subject lines either make the recipients chuckle or are bizarre enough to pique your interest. But it is always extremely clear what you will get when you open the email. ... Which brings us to our next point. 4) Align your subject line copy and email copy. You might already know how crucial it is for your call-to-action copy and your landing page offer to align. Well, it's no different when crafting your email subject line and email message. The first subject line, which was straightforward and much more accurate had a better click-through rate by 15.4% over the second subject line, which was more vague and less accurate. The key takeaway here? A high email open rate means nothing without any clickthroughs. Now that you've crafted a stellar email subject line, you have your audience's full attention on the body of your email message. So, how do you craft copy that will get them clicking? Here are the important components you need to know! Just like the email subject line should strive to establish relevancy through personalization, so should the copy in the message of the email. Again, it takes more than just a dynamic name tag for your email copy to convince readers that what's inside is relevant to them. So use the very beginning of the email to explain how you know each other. Take a look at that first paragraph, called out in red. Right off the bat, the marketers at Warby Parker tell the reader why they're being emailed (their prescription is expiring soon) and that this email is meant to help them find a new pair of glasses before that expiration date. Imagine if this email didn't have that first paragraph, and started instead with what is currently the second paragraph: "Getting a new prescription can be a hassle. Luckily, it's easy to make an appointment with an optometrist at our Newbury Street Store or through our friends at ZocDoc." ... Why are you emailing me about a prescription? Why would I want your advice? How do you know I live near Newbury Street? 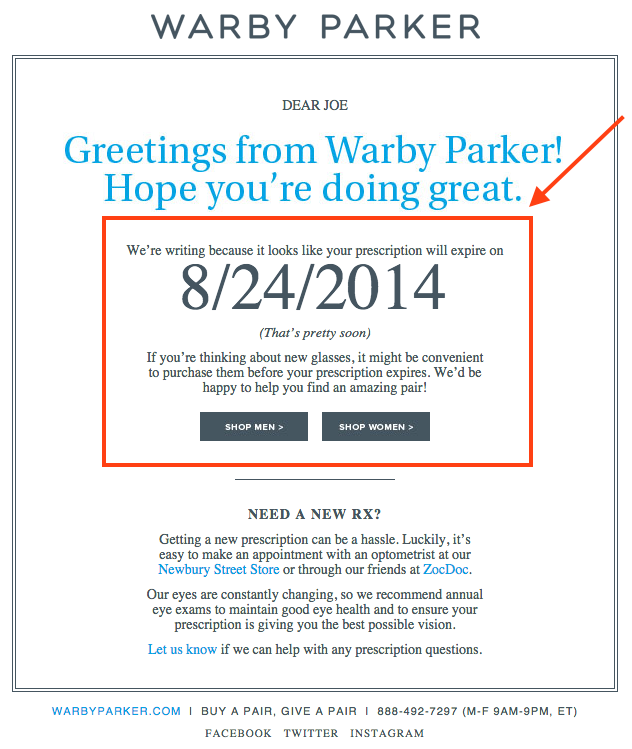 By reminding the recipient that they gave Warby Parker their prescription information in the past, there's a greater likelihood that that person will click through and redeem the offer in this email. 6) Write in the second person. Writing in the second person means using the pronouns “you,” “your,” and “yours." For example, "Before you leave in the morning, remember to bring your jacket." It means you orient the copy towards the reader, not yourself. Now, count how many times this email says "You" instead of "we" or "I." Okay okay, we won't make you count: The words "you" and "your" appear 12 times, while "we," "our," and "we're" appear only 5 times. That's a nice balance of second person language that keeps the focus on the customer, not the brand. This is a subtle tactic that helps you stay value-oriented, but this next step I'm about to cover is crucial to hitting the point home. 7) Talk about benefits, not features. You know the value of your email. But does your recipient? No, not yet. And it's your job to explain it. The problem is, many emails only explain the feature they are offering, not the benefit. Take a look at the copy in two separate ecommerce emails I've received. Which one is touting the feature, and which is touting the benefit? If you guessed email B, you're right. Email A throws a 30% off discount directly in your face, but doesn't explain the value behind it. What does 30% off a GoDaddy product do for my goals? Will it let me adjust a small business' expenditures on infrastructure costs, freeing up money for a new hire? That benefit is far more tangible than 30% off an undisclosed cost. Compare that with Email B from Banana Republic. The goal of this email is to sell shorts, but the copy isn't just shoving shorts down the recipient's throat. I mean, they're shorts ... big deal, right? 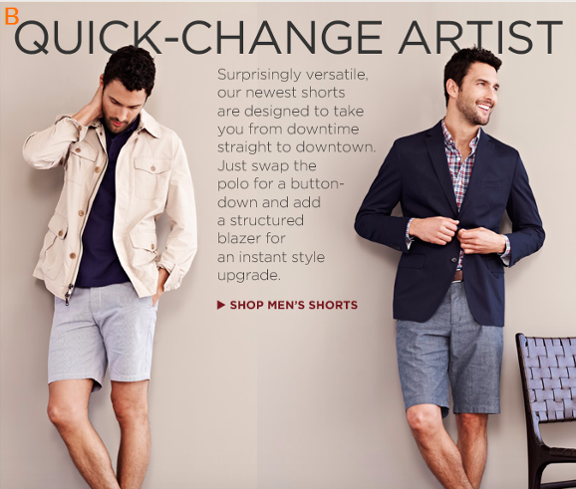 They've identified what makes these shorts worthwhile: their versatility. They allow a man to lounge around the house and then go out in the city while putting minimal effort into changing his outfit. How convenient! How easy! How versatile! The copy translates the benefit of buying those shorts, but the copy (or lack thereof) in GoDaddy's email doesn't explain the benefit of redeeming a generic 30% off offer. One of the worst mistakes email copywriters make is trying to shove the entire story into the email message. Think about when you open a marketing email in your inbox. Do you read every single word in there? Probably not. It's more likely that you scan for important points so you can glean the overall message, and decide whether you want to take any action. So if you're sending email with hundreds of words of copy, you're making it much more difficult for recipients to decide whether they want to click through -- simply because they can't quickly sift through all of the information in your email. Instead, find a way to summarize what the reader will get in a compelling way, and let them click through to a page on your website for more information. Postmates doesn't wait to get to the point. 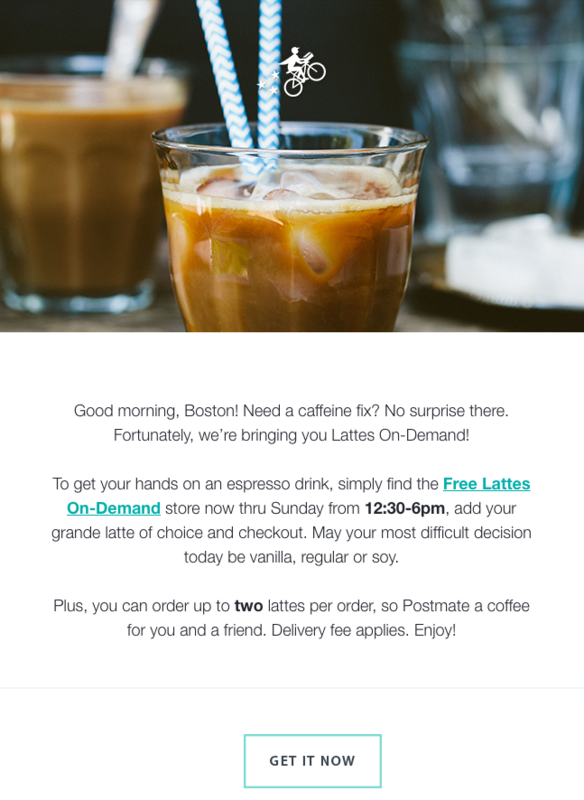 After a brief, friendly hello, they get right down to the purpose of the email: telling customers about their new "free lattes on-demand" promotion. After introducing the concept, they offer a few of the essential details, then get right to the call-to-action. 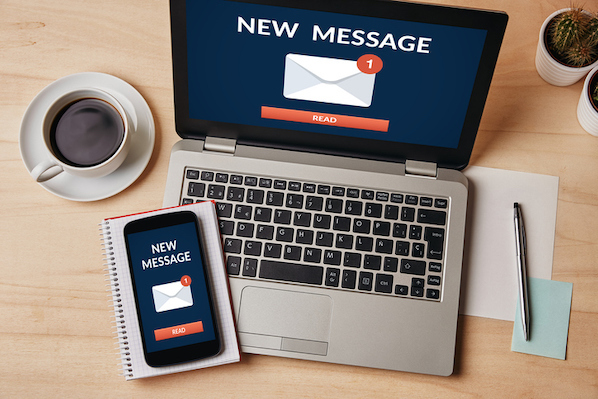 Keeping your message on-point is the key to writing brief email copy. What's the point you're trying to make with your email? If you know the action your email is supposed to drive -- recipient orders free lattes on-demand, recipient remembers to buy their Bruce Springsteen tickets, recipient gets motivated to work out -- then you'll have a much easier time drafting succinct email copy that remains focused on that one end goal. If writing succinct email copy isn't enough of a motivator for you to narrow down your goals, remember that having just one primary call-to-action in your email marketing results in better clickthrough rates than emails with competing calls-to-action. Just because emails are meant to inform doesn't mean they can't also delight. In some cases, email can be a great avenue for letting your brand's personality shine, helping you build a meaningful relationship with the folks on your email lists. After all, providing a lovable experience for people begins and ends with how you communicate with them. Check out the example below from the folks over at Death to Stock Photos. The point of the email is to apologize for an email they’d sent the previous day, which promoted a product that sold out way too quickly, didn’t ship internationally, and generally gave a lot of their customers a poor experience. Notice the part of the email that's called out in red. Using concise, personable language, they explain what happened, apologize for the mistake, say what they learned from it and how they'll prevent it from happening in the future, and give the recipient several options for following up. The format of this portion of the email is optimized for the large number of recipients who are likely skimming the email. The bold text and one-sentence paragraphs make it easy to follow. Finally, they aren't afraid to add some personality using phrases like "Give us a wavvveeee" to humanize their brand. The result? Recipients are probably much more open to forgiving them for the honest mistake. 10) Use actionable language in your call-to-action. That's right: Emails have calls-to-action, too. Well, the good ones do. First and foremost, your email call-to-action should be extremely easy to identify. Remember: People scan their emails. If there's one thing you want your recipient to pick up on, it's your call-to-action. If you're sending an HTML email, you may decide to include a button, like this AmazonLocal email did below. Great design: First, notice how the large, bright orange button stands out from the blue design; that call-to-action certainly isn't hard to find. Great copy: The copy on the button is just as important. Your call-to-action button should include language that is succinct, clear, and action-oriented. 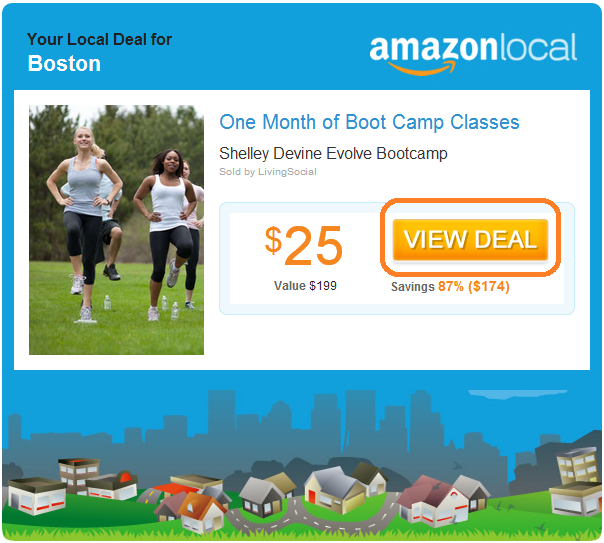 This AmazonLocal button tells you in very few words what you can do using verbs -- you can view the deal showcased in the email. 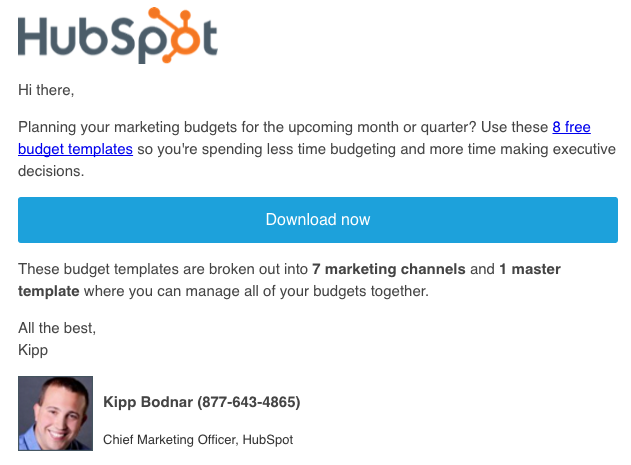 But it's also crucial to spend some time optimizing your plain-text emails for clear calls-to-action. No matter how fancy your HTML email are, not all email clients will render your images, and not all email recipients will choose to display your images. In fact, we studied whether HTML emails or plain-text emails performed best and found that, while people say they prefer HTML-based and image-based emails, in reality, simpler emails perform best -- and plain-text emails perform best of all. The message doesn't many graphics or colors added compared to most HTML emails. As such, the hyperlinked calls-to-action garner even more attention. When readers scan through the text and focus in on things like bolded words, images, and hyperlinked text, reiterating the same offer over and over hammers home for them exactly what you want them to do -- redeem your offer by clicking your call-to-action. What else do you think makes for effective email marketing copy? Share with us in the comments. Editor's Note: This post was originally published in May 2012 and has been updated for freshness, accuracy, and comprehensiveness.